We offer global footwear buyers premium footwear manufacturing in Ethiopia, based on our strategic partnerships with carefully selected factories. We have the strongest network of factories producing the highest quality footwear. WHY CHOOSE MADE BY ETHIOPIA ? We provide you the best choice of locally owned factories in Ethiopia. We offer cost effective, end to end solutions for making quality footwear, starting from development to production, and delivery to your warehouse, managing the entire order flow with those manufacturers from initial sampling to final production. All of our factories are experienced, audited and meet the international social and environmental standards. The Made by Ethiopia management team has both delivered product for and created iconic global brands using these same production networks, so we understand what the needs of the global market are and how to maximize value chains for high value finished goods. Through decades of experience in the footwear industry, we have developed solutions that make the difference. Made by Ethiopia combines knowledge and experience to create a unified network of shoe factories in Ethiopia. Our team includes Technicians, Quality controllers, Project Managers, Materials and Components sourcing specialists, developers and shoe designers. 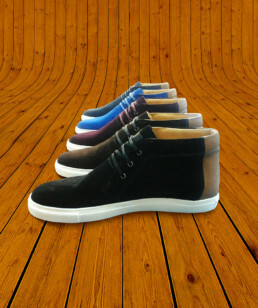 Our in house footwear development center offers immediate and creative solutions. Decades of Experience = Phenomenal Results Every Order!